Welcome! If there is a date you are interested in and do not see on the calendar below, please email us at info@salemfoodtours.com with your name, Tour desired (Salem Food Tour, AM Coffee Walk, Salem Spirits Trolley, or Afternoon Stroll), number of guests and possible date(s) you’d like. We’ll get back to you within 24 hours. Thank you! Our Tours are great for locals or visitors alike, as well as groups. If you are visiting and have a short window of time, we recommend our AM Coffee Walk or Afternoon Stroll. These shorter Tours include lot’s of good information about local history including Salem’s illustrious spice trade history, plus current info as to where to eat, shop, visit, etc. We highly advise taking our Walk or Stroll as early in your visit to Salem as possible. Many guests have commented how helpful it was so they could make the most of their Salem visit! 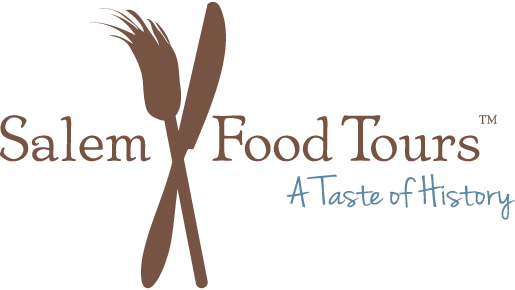 Looking for specific information on our regular Salem Food Tours? Please visit our FAQ page. Our sister Tour, the Salem Spirits Trolley, is available for private bookings for larger groups of up to 34 guests March through December. 2019 Public Dates TBA. Kindly note, all ticket sales are final. In the rare instance where we have to cancel a Tour, you will be given your choice of refund or credit for future date.